It may be hard for an egg to turn into a bird: it would be a jolly sight harder for a bird to learn to fly while remaining an egg. 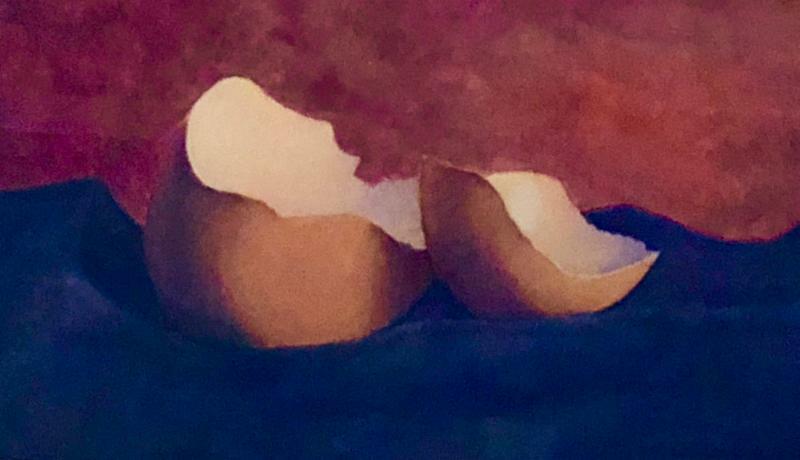 We are like eggs at present. And you cannot go on indefinitely being just an ordinary, decent egg. We must be hatched or go bad. Perhaps we stand before our broken and empty places with sorrow. But by God’s grace we now stand before them also with hope. The Easter Egg is an Empty Tomb, and Easter is its day. The egg has hatched. The bird has flown. The tomb is empty. Christ has been raised. Our empty places manifest endings. Our empty places manifest also new beginnings. Such is the grace of God. A blessed Feast of the Resurrection to you! Episcopal Church Presiding Bishop Michael B. Curry will be making a visitation in the Diocese of Massachusetts, Friday-Monday, April 26-29. 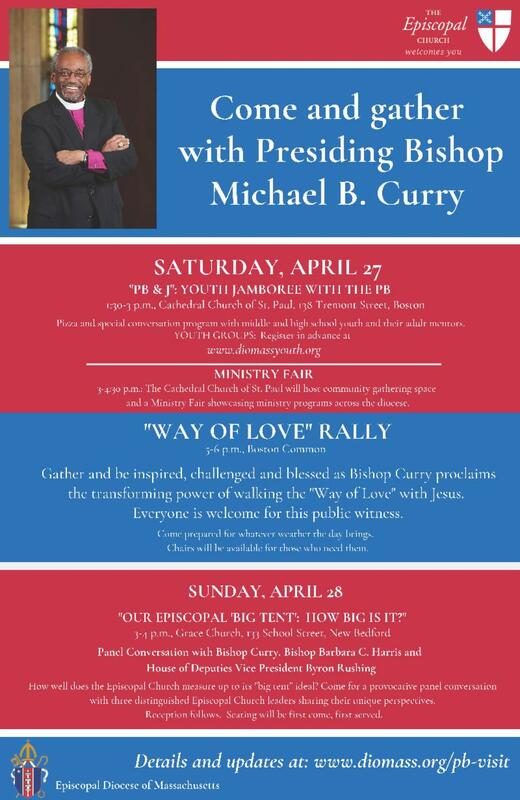 In addition to several ministry visits and meetings with designated groups that Curry will be making around the diocese over the course of the weekend, there will be public gatherings with him on Saturday, April 27 and Sunday, April 28 to which all are welcome. • Youth Jamboree with the PB, 1:30-3 p.m.
Pizza and special conversation program with Bishop Curry for middle and high school youth and their adult mentors. Register in advance here. 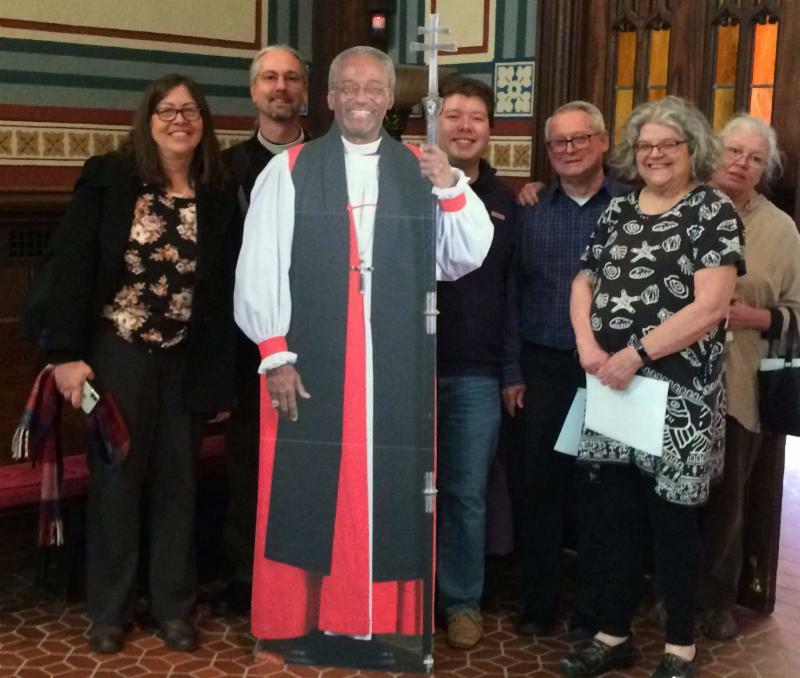 Presiding Bishop Curry is already on the scene (in the form of a life-sized cut-out) at Grace Church in New Bedford, pictured with the organizing team preparing to welcome the diocesan community to the April 28 "Big Tent" panel discussion. • Ministry Fair, 3-4:30 p.m. 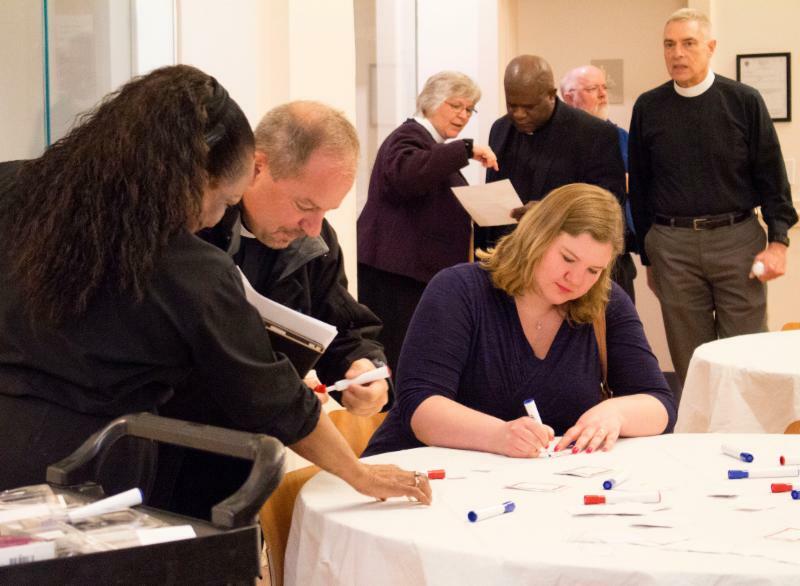 Leading up to the “Way of Love” Rally at 5 p.m., the Cathedral Church of St. Paul will host community gathering space and a Ministry Fair showcasing the good work of ministry programs across the diocese. • “Way of Love” Rally, 5-6 p.m. Gather and be inspired, challenged and blessed as Bishop Curry proclaims the transforming power of walking the “Way of Love” with Jesus. Everyone is welcome for this public witness! 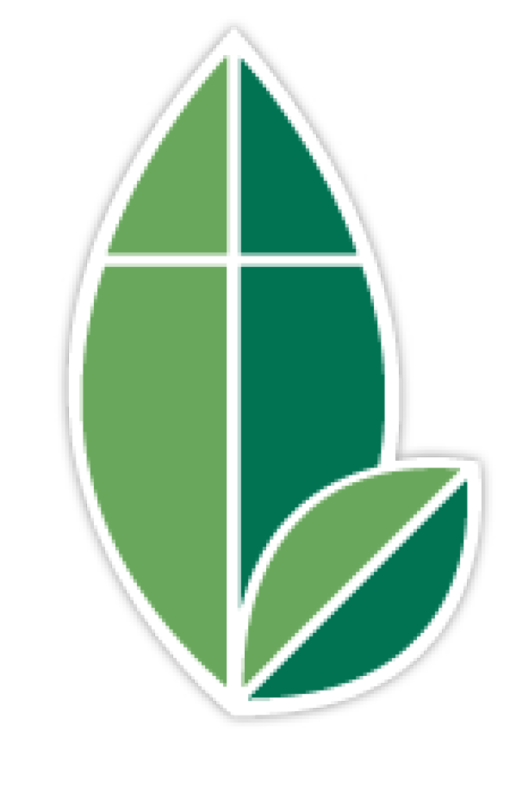 • “Our Episcopal ‘Big Tent’: How Big Is It?” 3-4 p.m.
How well does the Episcopal Church measure up to its “big tent” ideal? Come for a provocative panel discussion with Bishop Curry, Bishop Barbara C. Harris and House of Deputies Vice President Byron Rushing. Seating will be first come, first served. Reception follows. Find the flier here, and directions and parking information here. Everyone is welcome! : Visit www.diomass.org/pb-visit for details and updates on this exciting opportunity to spend time and make a public witness with the presiding bishop. Members of St. James’s Church in Cambridge hosted teams from Emmanuel Church in Boston and Trinity Church in Marshfield during their first Indaba encounter weekend in March. Courtesy photo. 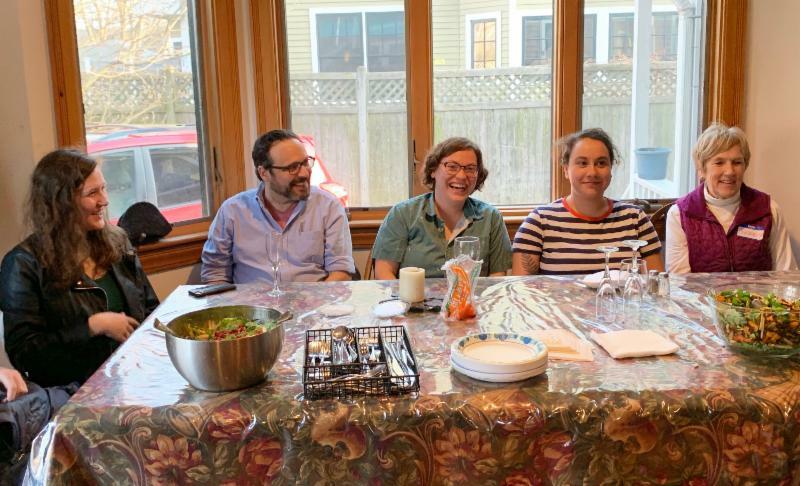 Indaba partners reap relationship-building rewards during first encounter weekend: Massachusetts Indaba 2019 is underway, and teams from each of the six participating congregations gathered at the end of March for the first of three encounter weekends they will be experiencing together over the course of the year-long initiative. St. James's Church in Cambridge hosted guests from Emmanuel Church in Boston and Trinity Church in Marshfield, while St. Andrew's Church in Wellesley played host to teams from St. Paul's Church in Bedford and St. David's Church in South Yarmouth. New friendships as well as insights gleaned from the discovery of similarities, as well as differences, were highlights of the experience, according to the weekend's hosts. Episcopal Church prays for Notre Dame of Paris: In the immediate aftermath of the April 15 fire that destroyed the roof and spire of Paris's Notre Dame cathedral, Presiding Bishop Michael B. Curry joined with the Very Rev. Lucinda Laird, the dean of the American Cathedral in Paris, and Convocation of Episcopal Churches in Europe Bishop in Charge Mark D. W. Edington, to offer a message of "sincere condolences and our readiness to offer any hospitality that would be of help to the community and congregation of Notre Dame." "The cathedral of Notre Dame is more than an icon of the city of Paris; it is an ancient place of worship at which Christians have gathered for nearly a thousand years. In this most sacred of weeks in the Christian year, all Christians mourn the damage caused by the ravages of a terrible and destructive fire in that holy place," the leaders said in their message. Clergy of the diocese gathered at the Cathedral Church of St. Paul in Boston on Holy Tuesday for the renewal of their ordination vows and the blessing of holy oils. Afterward, they signed a poster conveying condolences and encouragement, to be sent to the people of Notre Dame cathedral in Paris. "The Episcopal Church throughout Europe, with its seat in the Cathedral of the Holy Trinity in Paris, expresses its sympathy to the people of Paris and to all who sense the immense loss of this priceless and historic house of worship. We extend to Archbishop Aupetit and to all his people our sincere condolences and our readiness to offer any hospitality that would be of help to the community and congregation of Notre Dame in this most holy season of the faith we share. And we send our prayers in this week that ends in what we know to be the sure and certain promise of resurrection for the future life and restoration of this monument of Christian faith." 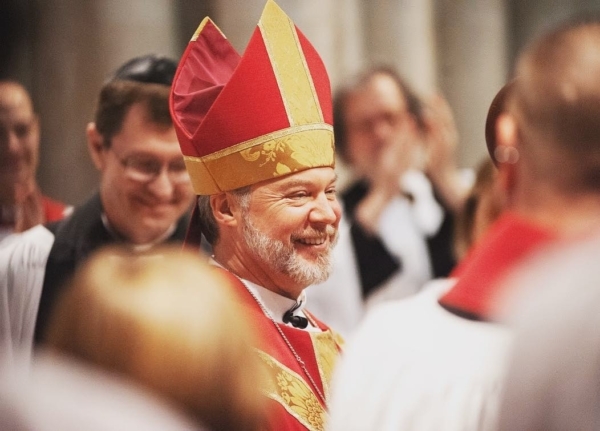 Edington became the 26th bishop in charge of the Convocation of Episcopal Churches in Europe on April 6 at the Cathedral Church of the Holy Trinity in Paris. Curry led the service of ordination and consecration; Bishop Alan M. Gates and Bishop Gayle E. Harris of the Diocese of Massachusetts were among the co-consecrators. Read more here. "Hallelujah, Anyhow! ": Presiding Bishop Michael B. Curry's 2019 Easter message: “In the moments of despair, in the moments of the worst darkness, God had done something incredible,” Episcopal Church Presiding Bishop Michael B. Curry says in his 2019 Easter message. “God had raised Jesus from the dead.” Video and text of the message are online here. Consume less, share more, take the creation care pledge: Several hundred people to date have signed on to the church's "Pledge to Care for Creation." Its goal is to gather at least 1,000 pledges with concrete, personal commitments by Earth Day, April 22 Find the pledge here. “We hope people understand this is more than adding your signature to a petition,” the Rev. 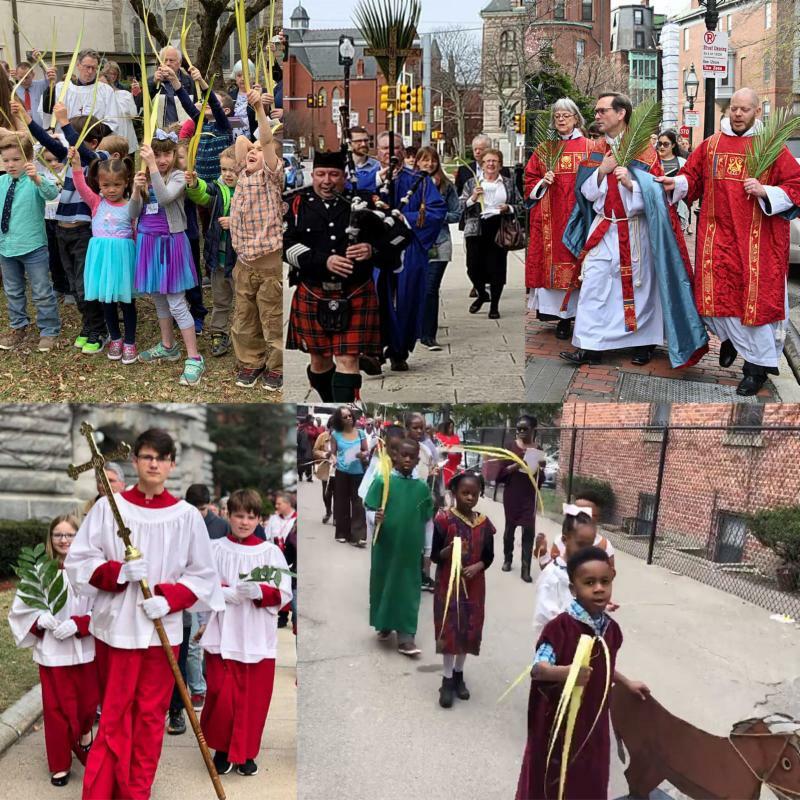 Melanie Mullen, the church’s director of reconciliation, justice and creation care, said in a March 5 Episcopal Church Office of Public Affairs news release. “Think about what you love in God’s creation, where your heart breaks over environmental injustice and how you’d like to simplify your life--consume less, share more.” Read more here. Mother's Day Walk for Peace: Everyone is invited to join Bishop Alan M. Gates and the B-PEACE for Jorge Campaign again this year in making a public witness against gun violence by participating in the Mother's Day Walk for Peace on Sunday, May 12. Walkers will gather at Town Field Park (1520 Dorchester Avenue) in Dorchester, where the event starts with on-site registration beginning at 6 a.m., program at 8 a.m. and step-off at 8:30 a.m. Walkers can also join the walk at a second entry point at 9:45 a.m. at Madison Park High School (75 Malcolm X Boulevard, Roxbury Crossing). The walk concludes with a ceremony at Boston City Hall at 11 a.m.
Register with the B-PEACE for Jorge team here and find more information about the walk at www.mothersdaywalk4peace.org. Join “Encounters in the Holy Land” mission pilgrimage: Join Bishop Gayle E. Harris and the Rev Debbie Phillips for “Encounters in the Holy Land,” a mission pilgrimage in Israel and Palestine, Oct. 1-15. 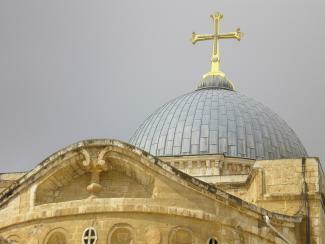 The mission pilgrimage will combine visits to holy sites in Jerusalem, Bethlehem, Jordan Valley and the Dead Sea, Nazareth, Galilee, Nablus and Ramallah with opportunities to learn about active mission in the Episcopal Diocese of Jerusalem through its school, healthcare and peacemaking ministries. The registration deadline is May 15. The group will meet three times before the trip for orientation and community building. Estimated cost is $4,100 per person (double occupancy), with all payments due by July 15. For more information, contact David Ames (617-482-4826, ext. 445). 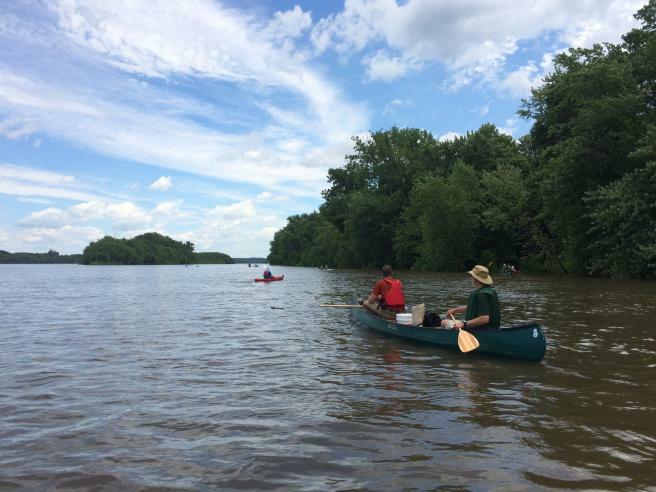 Paddling Pilgrimage: A Taunton River paddling pilgrimage is in the works for this summer through Kairos Earth, the organization behind the New England Episcopal dioceses' 2017 "River of Life" Connecticut River pilgrimage. May 17 is the deadline to apply for the Taunton River trip, which runs June 13-20. The journey is split into two segments, from Middleborough to Somerset and from Somerset to Narragansett Bay, and paddlers can choose one or both. The pilgrimage is organized as an outdoor spiritual experience, based in the Christian tradition, with times of silence, prayer and reflection. Find more information here. In 2017, the New England Episcopal dioceses sponsored the orginial "River of Life" paddling pilgrimage that inspired this summer's Taunton River trip. Summer camp registration is open: The Barbara C. Harris Camp in Greenfield, N.H., aims to be a place where all campers feel accepted and are able to develop authentic friendships, learn important life lessons and gain new perspectives as they live and play in a community centered on Christian values. The Barbara C. Harris Camp offers five sessions, each six days and five nights, for 4th-12th graders. 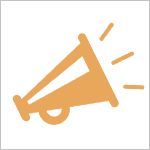 Financial assistance and summer staff positions are available. Visit www.bchcenter.org/bchcamp for information on sessions, themes, activities and pricing. Questions may be directed to the camp registrar, Abby, at 603-547-3400. Open Guest Weekend, July 12-14: The Open Guest Weekend is designed for families, couples and individuals to unwind from their usual routine, unplug computers, shut off phones and refresh the body and soul in the relaxing natural environment at the Barbara C. Harris Camp and Conference Center. While there will be optional group activities scheduled throughout the weekend, guests may spend their time however they choose. All types of lodging are available, from lodge rooms to cabins. For more information visit www.bchcenter.org/retreats. Global Mission "Speed Partners": On Saturday, April 13 the diocesan Global Mission Commission hosted a "Speed Partnering" event as a matchmaking opportunity for congregations and organizations with established global mission efforts to connect with other congregations and individuals who would like to join them. Representatives from organizations and parishes gave short presentations about their mission projects, including partnerships in Latin America, the Middle East, the Caribbean and Africa. In addition to these presentations, Bishop Gayle E. Harris discussed the importance of global mission relationships, and diocesan staff members presented information about available grants and opportunities for youth mission. Weren't able to make it to the event, but interested in learning more about opportunities for mission partnerships? Contact the missioners for global partnerships: The Rev. Holly Hartman or The Rev. Marilyn McMillan. 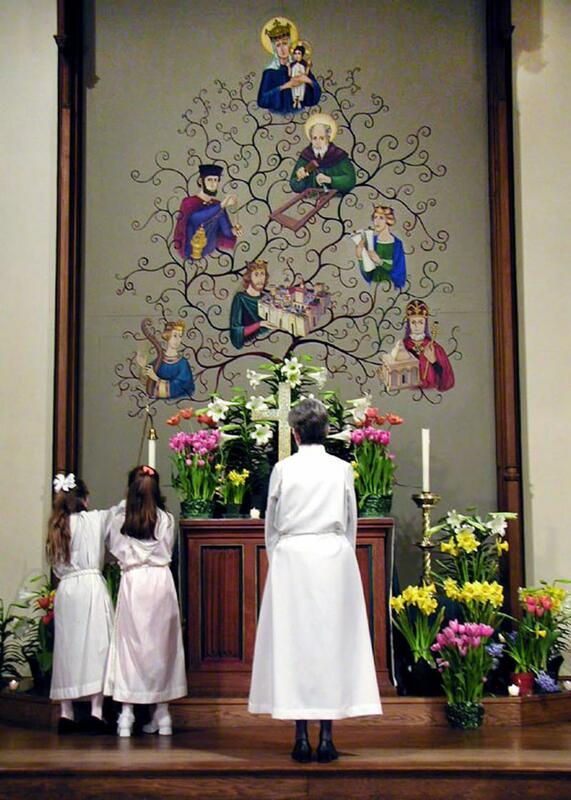 New home needed for Jesse Tree mural: In 1971, artist Martha Bancroft painted a 16-foot mural of a Jesse Tree for the chancel wall of the former Parish of the Messiah in Auburndale. When Messiah merged with Trinity Church in Newton Centre in 2015, the mural was removed and is now in need of a new home. The mural is 10 feet by 16 feet, oil on wood, and is intended to look like a medieval tapestry with figures painted in the style of "The Book of Hours" and the Mary Window of Chartres Cathedral. "I have always known that my creativity is a gift from God," Bancroft said in an e-mail. "But creating a mural, the largest work I would ever do, helped me realize and trust that the process of creativity, first the idea, then the form, was how God would work through me." "Many asked where I got my ideas, my inspiration, and all I could say was I just held the brush and God did the work," Bancroft said. The mural is currently dismantled into four panels and Bancroft has offered to oversee the assemblage and any touch up painting that might be required--offering the mural as a gift to any congregation that wants it. Congregations interested in the mural are invited to contact Martha Bancroft directly. 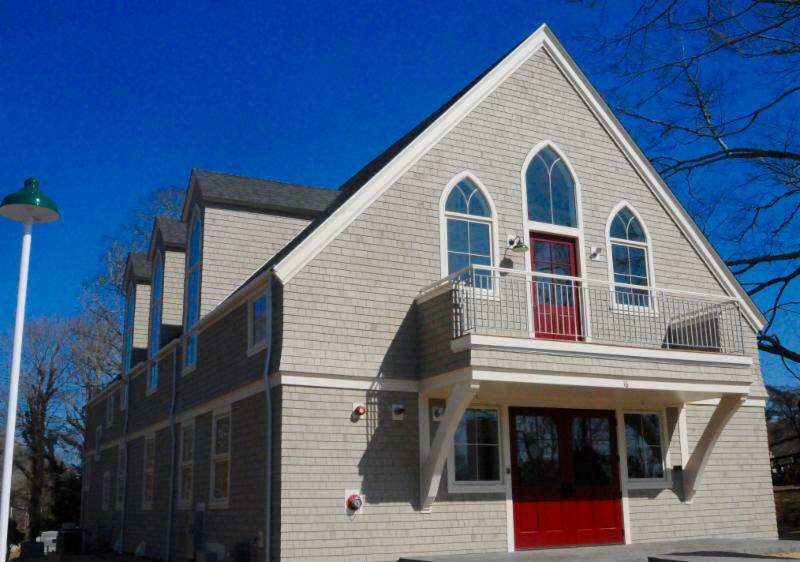 New Parish and Community Center: The Church of the Messiah in Woods Hole will open its new Parish and Community Center on Church Street during an 11:30 a.m. reception following the Easter Day service on April 21. It is a renovation, funded by a $2.5-million capital campaign, of the original first church that was built in 1852 and that has occupied the site since the current stone church building was constructed in 1888. The Church of the Messiah in Woods Hole will host its first public event, an Easter Day reception, in its new Parish and Community Center on April 21. A series of special events after Easter is being planned to introduce the public to the Parish and Community Center, which will be dedicated on July 7, following the 10 a.m. Sunday service, by Bishop Alan M. Gates. Read more here. 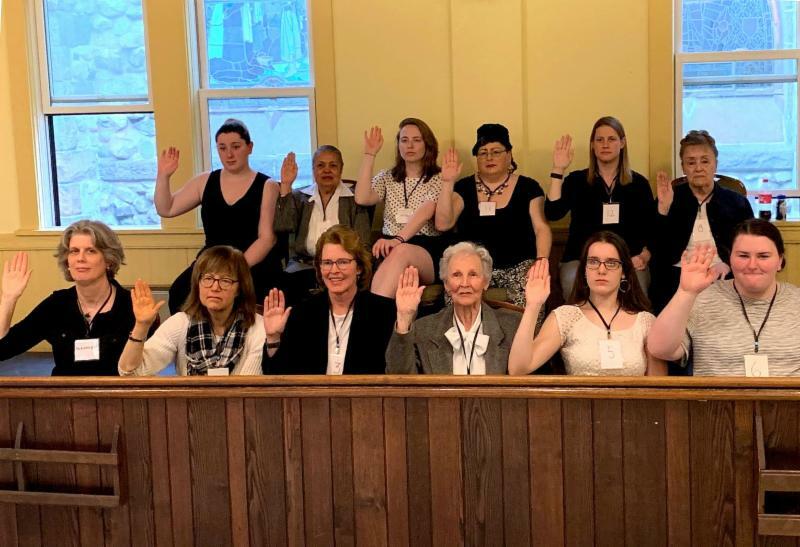 Grace Church, Medford's "12 Angry (Wo)men": On Sunday, April 7, Grace Church in Medford presented “12 Angry Men Performed by 12 Impassioned Women"--in which 12 women from the parish performed a staged reading of Reginald Rose's play from 1954, 12 Angry Men. The original play is about a group of jurors who are convinced of an accused murderer’s guilt, but who are forced to think about their morals and prejudices in the meeting room. "Many of our youth were surprised to learn that women were not allowed to serve on juries so recently," Grace Church's rector, the Rev. Carol Morehead, said in an e-mail. "And while we have made great strides in balancing the gender inequality in our church and our country, hearing women's voices in this play is a powerful reminder that we still have work to do," Morehead said. Salem Bay Collaborative Choir Camp: A new music camp, Salem Bay Collaborative Choir Camp, at St. Peter's Church in Salem, will be introduced this summer for boys and girls ages 8–14. Directing the camp is Mary Jodice, Director of Music at St. Andrew's Church in Marblehead. Choristers attending the camp will learn music, sight singing and Bible stories, and play movement games. The camp will culminate in a service of Evensong on Saturday, June 29, in which the choristers will be joined by adult singers. Applications are due June 1. Find more details here. "The Gift of Multiplicity of Expression": Listen here to an interview with Diocese of Massachusetts regional canon Bishop Carol J. Gallagher on Connecticut's "Coffee Hour at The Commons" podcast (episode 41). NorthEndWaterfront.com: 244th Lantern Ceremony Lights Up the Night on Patriot’s Day Eve: The 244th Lantern Lighting Ceremony was held on Sunday night, April 15, the eve of Patriot’s Day, at Old North Church in Boston’s North End. The Lantern Ceremony celebrates the events of the night of April 18, 1775, when two men acting under the orders of Paul Revere snuck into the Old North Church late at night, climbed up Boston’s tallest steeple and hung two lanterns. Their act of defiance against military occupation and monarchical rule ushered in the start of the American Revolutionary War. Ever since the 1875 centennial anniversary of the lantern hanging, Old North has invited guests and community leaders to participate in a ceremony honoring the patriots who made that midnight ride possible. With retirement coming at the year's end for its vicar, Old North's lantern ceremony this year was the last for for the Rev. Stephen T. Ayres. Read more here. 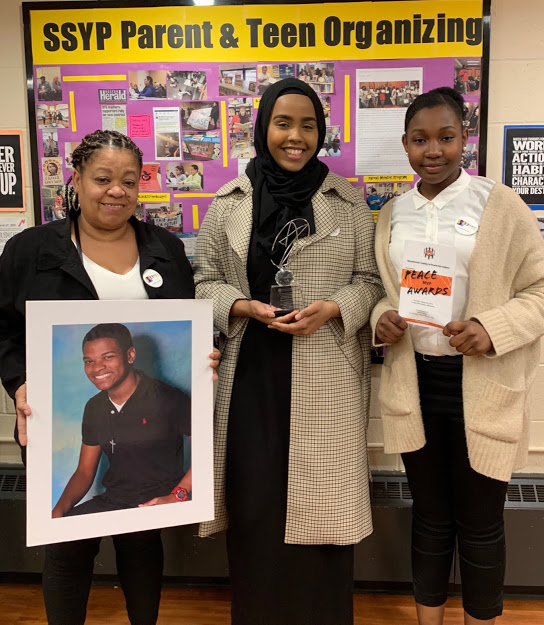 South End News: B-PEACE for Jorge Campaign receives statewide award: On March 28, the B-PEACE for Jorge Campaign received the prestigious Peace MVP Award from the Massachusetts Coalition to Prevent Gun Violence. With its Peace MVP Award, the coalition recognizes significant and meaningful work by individuals and organizations to stop the scourge of gun violence in Massachusetts. 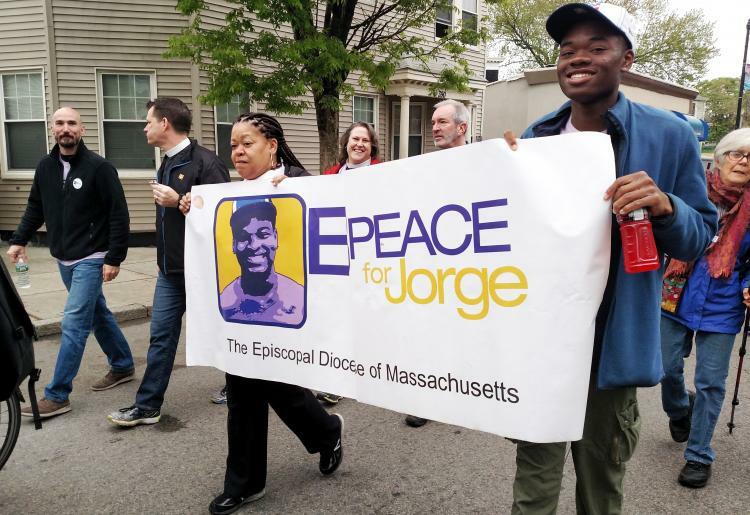 The B-PEACE for Jorge Campaign is a project of the Episcopal Diocese of Massachusetts and, while based at St. Stephen's Church in the South End of Boston, B-PEACE has a statewide reach. Several other gun violence prevention organizations led by young people, including March for Our Lives-Boston, also received awards. Read more here. Wicked Local Billerica: Bedford, area residents gather at Burlington mosque: A week after deadly attacks on Muslim worshipers in Christchurch, New Zealand, those who came together under the covered entrance to the Islamic Center of Burlington on March 22 were there for an interfaith service and vigil, to show support, caring and solidarity. Newly elected Selectman Emily Mitchell, of Bedford, stood with Rev. Chris Wendell, pastor of St. Paul’s Episcopal Church. They held a posterboard signed by church and community members, expressing fellowship and welcome. “We felt we needed to express support with the whole community,” Mitchell said. Read more here.